Continuing north, anticipating the arrival of visitors, Brian and I stopped at Black Point knowing we could easily reprovision. 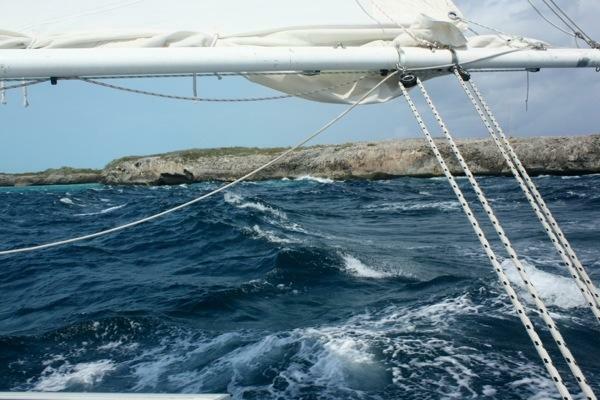 Moving at top speed, a blazing 6knots, we had a swift sail from Rudder Cut under a single-reefed main up Exuma Sound. We entered Dotham Cut and had our first experience with wind against current (bonehead move) coming through the cut. Wheeee! Rode Trip was ridin’ the waves all the way through while Brian fired up the engine for an extra boost. The current quickly dropped our speed to 2knots mid-cut. Looks like gale conditions behind us, but really that’s the current rushing out of the cut. That evening, Brian and I went ashore for Happy Hour at Scorpio Inn. It was distinctly cruisers’ happy hour; the only locals we chatted with were tending bar. We enjoyed COLD beers, two-for-$5 rum punch, and free wifi. We also met the crew of Wanderer, a sailboat we’d encountered several times since entering the Chesapeake however had never had an opportunity for introductions. Lovely chatting with David and Michelle. They also shared a helpful bit of information; the ship would arrive from Nassau tomorrow with fresh groceries. Perfect timing! The next morning Brian and I headed ashore in search of ice. We found block ice ($5/block) at the home of a local woman. She was very friendly. We purchased two blocks of ice and hurried back to the dinghy to get it into the cooler. Then we waited for the ship to arrive. We were glad to be at Black Point for the ship because then we could get fresh produce for our visitors. At 1:30pm we decided to confirm this ship arriving rumor with the store tender. 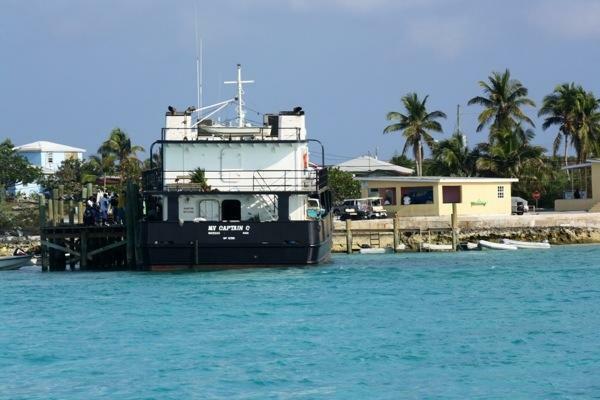 Yes, the ship was still due to arrive however had run aground while departing Staniel Cay. Now the ship was on tide-time and had to wait for high tide at 3:00pm to leave Staniel. It finally arrived at 4:00pm but we weren’t able to shop as it wasn’t completely unloaded until sometime after 6:00pm. The morning our visitors were due to arrive at Staniel Cay, we were still at Black Point. Straight away we went to the grocery store. Even with the Nassau shipment the pickings were slim and we didn’t completely fulfill our shopping list. Guess we’ll figure it out and improvise the menu. We were able to purchase potatoes, carrots, oranges, grapefruits, some canned items, ground beef and pork ribs. Once the food was stored back at the boat, we set sail for Staniel Cay. This entry was posted in Uncategorized and tagged bahamas, black point, exuma islands by stephanie. Bookmark the permalink. It’s surprising that the freighter ran aground. Figures it had to be when you were getting ready for visitors. Hope you all have a great time.